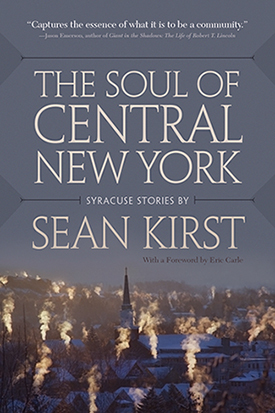 Central New York journalist, columnist and author Sean Kirst has released “The Soul of Central New York: Syracuse Stories,” a collection of his past columns, published by Syracuse University Press and available Dec. 14 in hardcover and paperback. In “The Soul of Central New York,” Kirst, who spent nearly 25 years as a columnist at the Syracuse Post-Standard, showcases some of the most memorable stories about struggles and triumphs of the ordinary men and women who define Syracuse. Readers will learn how the city of Syracuse is intertwined with the spiritual roots of the Six Nations of the Iroquois (also known as the Haudenosaunee) in one piece. Another story details the experience of a grieving father whose son was lost to violence on the streets of the city. Kirst will be participating in a book launch, talk and signing where you can hear him discuss tales from the book, like how a group of strangers risked death along the New York State Thruway to save a soldier from a burning truck or learn about the beautiful yet tragic connection between Vice President Joseph Biden and Syracuse. The book tour will take Kirst to three area locations in Syracuse: Wednesday, Dec. 14, at 4 p.m. at the Onondaga Historical Association; Thursday, Dec. 15, at 7 p.m. at the Barnes & Noble on Erie Boulevard East; and a third event, hosted by the Strathmore Speaker Series, on Tuesday, Dec. 20, at 7:30 p.m. in the Community Room at the Marriott Syracuse Downtown.